I have admired (OK, you can say lurked) over there for awhile now...but yes, this week I am jumping in. This set up was done a couple of years ago as part of a photo shoot. So, yes, there was a little help in pulling this together, but I chose to share it because...I have this obsession with black and white right now, I still LOVE this look, and it may provide a little inspiration for others. Now, of course, it is January, and I am thinking winter..
(currently spending some time on the coast in Central California). So, to me, winter is not about snow and ice. and a crisp tingle on your nose as you walk along the ocean. with the California Coast as your backdrop. Embrace the clean lines of a vintage-inspired, slightly art deco influenced design married to the striking contrast of black and white for a look that is unexpected. 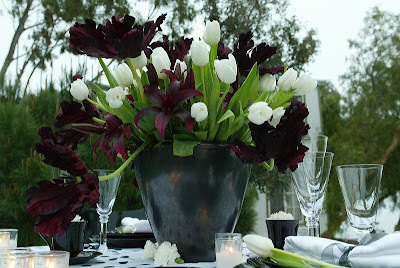 and white tulips, with a hint - here and there- of simple white carnations (I love carnations) is perfect in a simple glossy black vase. a little whimsy...a little modern! A gorgeous peacock feather adds sophistication and texture. Hope you enjoyed the little bit of eye candy. This is one of my favorite things about being a wedding planner! 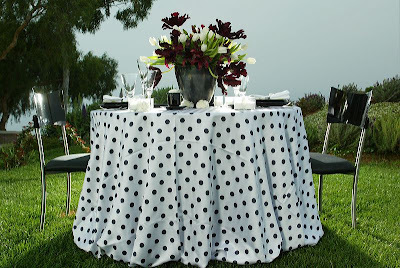 Linens: BBJ Linens, Polka Dot Lamour table linen and white lamour napkins. LOVE your table! Merci for stopping by! ENJOY your first tablescape! What a wonderful bit of lovely to enjoy on this rainy, dreary morning. Thanks for lifting my spirits with this inspired tablescape. You have a talent, that's for sure! I LOVE that!! So, when you come and cook for me, you'll set the table too?? 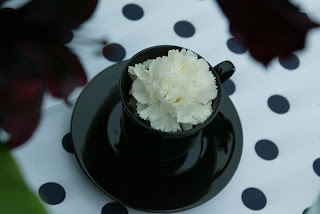 This is my fav,black and white,love your blog and tablescape. OMG, you have such an eye for decorating~! BEAUTIFUL! This is so beautiful!! I wanna go there right now! Gorgeous! I would love to enjoy a romantic dinner at that table! Holly, that is absolutely stunning - simple yet elegant. It is no wonder that you are such a successful wedding planner - you have an eye for detail! Gorgeous!! I LOVE the black and white polka dots!! Simply beautiful! I'm a fan of BBJ linens as well whenever I use rentals for my clients larger parties. Thanks for visiting my blog as well! Well done, Holly! 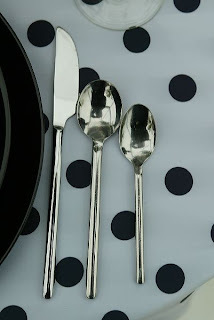 I love the polka dot tablecloth...it adds a bit of whimsy. The place cards with feathers are cool, too!! What a beautiful job you've done. I love that white & black contrast and polka dots are my favorite. Oh gosh this is so fabulous! I too love love black and white! Polka dots can I ever get enough....Love that!! I loved the black and white and the polka dots. Also, the pop of color in the bouquet in perfect! 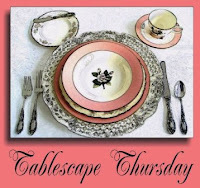 Please keep posting tablescapes. So elegant! Fantastic! Loved everything about this tablescape...especially the polka dots and the tulips. I am jealous of your "...winter is not about snow and ice. It is about clear days where the sun glows...beautiful winter sunsets that make me smile...and a crisp tingle on your nose as you walk along the ocean." Beautiful!! Love the flowers. And the black and white does just make everything pop. Wow, wow, wow!!!! Absolutely stunning! I am loving the parrot merlot flowers so much! Gorgeous! The feathers are the perfect touch! I love it! I love black and white anytime of year, any location. I also love polka dots and tulips. So, you really got me with this one. Once you start playing with your dishes for Thursdays...you will be hooked. I can't wait to see what you do next! Love it!!!! 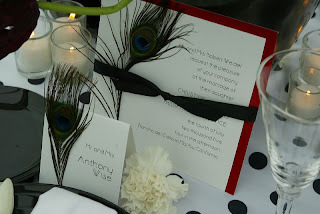 The centerpiece is beautiful, the place cards with peacock feathers are so clever and elegant ( I love peacocks) and everything looks classy and fun and modern! Welcome to TT! Your first one and it's a beauty! Love the flowers. Have a great day! Now that's what I call a "Debut"!!! That's beautiful, Holly! I love the polka dots! Beautiful...so glad you took the plunge!!! I love polka dots and black & white....I have never been artistic or good about this sort of thing...which reminds me. We are hosting a wine & cheese reception type thing at our house in a month. I may totally need your input on how to set stuff up. We're on a little bit of a budget, and it's not going to be a huge gathering, but I still want it to look nice. It's fabulous! The flowers are amazing ~ if only my table looked as beautiful. Fun and classy at the same time... a perfect combo!!! That is SO gorgeous. Ohmygosh. I love it. I am so in love with that tablecloth besides all the lovely tulips and all the rest! What an awesome job you have! Love black and white and with a tad bit of color! Definately fun "eye candy". Absolutely stunning! I love the classic look of the black and white. The Polka Dots are just too cute. I love this!!! You are certainly gifted. This was gorgeous! We had a black and white wedding with red thrown in for accent. It was my husband's wedding. I just showed up in my gown. He'd been the best mad at eight weddings. He was two months shy of 40 when we married (both for the first time). He wanted the full blown dress military wedding...he wanted it at the Naval Academy. I did draw the line there. We couldn't have our pastor. And we only got thirty minutes to get in, get dressed, get married and get out. The rest was his, except that I insisted on red roses, because I love red. Truly beautiful and very striking, I love the black and white with touches of red! Hi there, I'm a new follower from Friday Follow! Nice blog! Love this bold black and white, Holly! Woohoo! Thanks for linking up at Friday Follow. I am already following you and wish you many more followers today. Happy Friday Follow! New Follower from Follow Friday. Stopping by from Follow Friday! LOVE the tablescape, simply beautiful. Just stopping by to say hello. I followed your blog last week. Oh my goodness, that it so beautiful! I absolutely love the flowers! That is just stunning!! Following from Friday Follow!! The black and white is beautiful!!! Can I come over and eat?? That table scape is beautiful, I think the flowers "make it". You have a beautiful blog, I especially love your header. I'm now a Follower through Friday Follow. Have a great weekend. Absolutely beautiful. I'm following you now and would love to have you follow back. Happy Friday Follow! Beautiful! You have a great eye. New Friday Follower here. :) Have a great weekend! That's gorgeous! :) I love it! That is a beautiful tablescape! I find that food always tends to taste better if served on a prettily set table. I'm a new follower through Friday Follow! I have that same fabric I love how the flowers make it pop! beautiful table! New Friday Follower:) I have been married 8 years, but so want to go back in time and have this as my table setting! AH-mazing! I am now following you...I love your blog! New Friday Follower here. This blog rocks! So glad I found you. I'm with follow you Fridays. Inspirational. I love to eat at a beautiful setting but rarely do one. This is lovely. Makes me want to be calm and cultured and relaxed in elegance. What a great table setting! It's beautiful, but very simple. Absolutely beautiful, here through Friday Follow! stoppin' by from Friday Follow! Love the Black and white! I also like the chalk board trays! Cute idea. I'm here from Friday Following! Very elegant table. I love the centerpiece and the peacock feathers. Interesting that you put the knife with the sharp side out. I know you will be back for other Tablescapes. I'm here from Follow Friday and love your blog! I'm a total foodie!! Looking forward to getting to know you!! 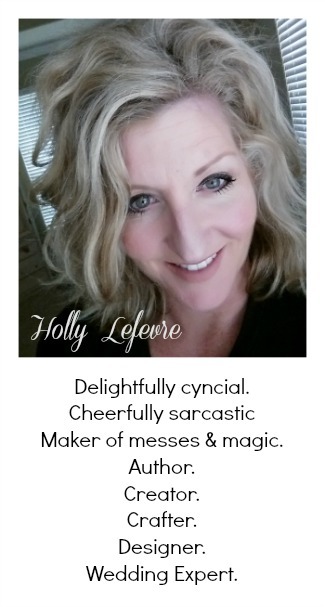 I'd love for you to stop by and check out our blog too! Well hello! We're so glad that you jumped into the tablescaping meme with us -- nice to meet you and I love what you've shared with us today -- it's part elegant and part whimsical (how could polka dots be anything else?) and all comes together beautifully on your table. Hope you'll be back again and again. I love your table. It reminds me of my wedding. Thanks for hopping with us this week. Following you from Friday Follow. Great pictures. Thanks for linking up and following at the Trendy Treehouse. holly, i love this!! black and white is so chic:) have a great weekend! 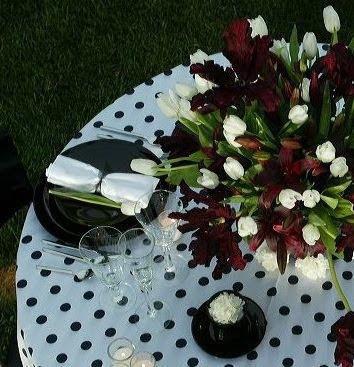 I never thought that Black and white and polka dots at that could look so elegant together. I LOVED all the wonderful photos. Thank you for sharing. I'm popping in for the first time but not the last from Friday Follow. How gorgeous Holly! Love the polka dots. Your blog is just wonderful! I will be back again soon for more inspiration. Come by and visit me anytime! Beautiful recreation of classic theme with delightful little twists. Thanks for sharing the inspiration. Talk about the WOW factor! you nailed it girl! I love, love, love the flower arrangement. Beautiful! coming through from Friday Follow! Love this table setting..everything is nice!! Gorgeous! I love the polka dots and peacock feathers- too die for! Tablescape Thursday...Blame It On The Blackout! It's Illuminating...It's a Lisa Leonard Giveaway! There's Bacon in My Chocolate! Thought for the Day...I Mean Year!